Glues for gluing flooring and wall tiles; additives for cements and concretes; drilling muds for drilling machines. Limes, cement, plasters; ready concretes, natural stones, artificial stones, natural marbles, artificial marble; inside and outside front coverings of buildings made by natural and artificial stones; coverings for inside and outside parts of buildings made by natural or artificial marbles; floor coverings made of natural or artificial stones and marbles; wall tiles (ceramics), paving stones; doors and windows made of wood or plastics, door and window frames; glass products for buildings, namely glass bricks, glass panels and glass tiles. 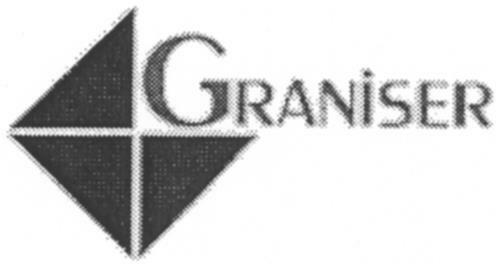 On Monday, July 14, 2003, a canadian trademark registration was filed for the above pictured logo by Graniser Granit Seramik Sanayi Gaziler Cad. Yenisehir Is Merkezi, 478/m PK:35110, Izmir, TURKEY . The Canadian IP office has given the trademark application number of 1184324. The current status of this trademark filing is Interruption of proceeding. The correspondent listed for is OYEN WIGGS GREEN & MUTALA LLP of 480-THE STATION, 601 WEST CORDOVA STREET, VANCOUVER, BRITISH COLUMBIA, CANADA V6B1G1 The trademark is filed in the description of Glues for gluing flooring and wall tiles; additives for cements and concretes; drilling muds for drilling machines. , Limes, cement, plasters; ready concretes, natural stones, artificial stones, natural marbles, artificial marble; inside and outside front coverings of buildings made by natural and artificial stones; coverings for inside and outside parts of buildings made by natural or artificial marbles; floor coverings made of natural or artificial stones and marbles; wall tiles (ceramics), paving stones; doors and windows made of wood or plastics, door and window frames; glass products for buildings, namely glass bricks, glass panels and glass tiles. .
(1) - Glues for gluing flooring and wall tiles; additives for cements and concretes; drilling muds for drilling machines. (2) - Limes, cement, plasters; ready concretes, natural stones, artificial stones, natural marbles, artificial marble; inside and outside front coverings of buildings made by natural and artificial stones; coverings for inside and outside parts of buildings made by natural or artificial marbles; floor coverings made of natural or artificial stones and marbles; wall tiles (ceramics), paving stones; doors and windows made of wood or plastics, door and window frames; glass products for buildings, namely glass bricks, glass panels and glass tiles.